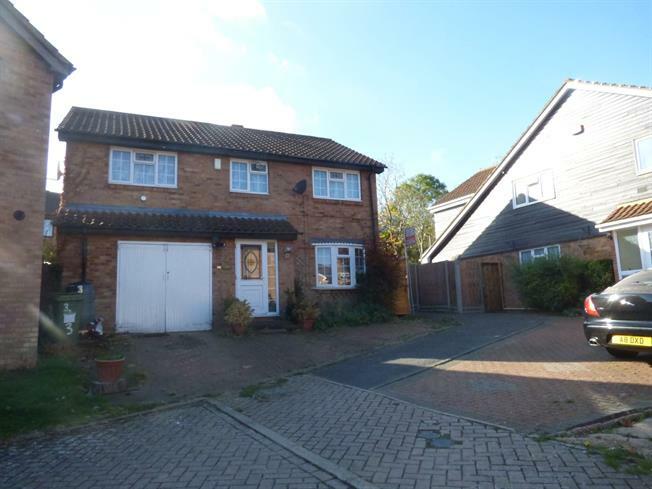 4 Bedroom Detached House For Sale in Milton Keynes for Asking Price £310,000. Offered for sale with no upper chain, this four bedroom detached house is situated in a cul de sac location within easy access of Central Milton Keynes main line train station and shopping centre. The accommodation in brief comprises of entrance hall, lounge, kitchen/dining room, first floor landing, master bedroom with en suite bathroom, three further bedrooms, bathroom, gardens and garage/further accommodation. Via door leading to entrance porch with further door to entrance hall. Double glazed bay window to front aspect, radiator, TV/FM points. Single sink and drainer with cupboard under, further range of fully fitted base and eye level units, roll top work surface with tiled surround, built in oven and hob with extractor hood over, tiled flooring, window to rear aspect, space for fridge freezer, patio doors opening out in to rear garden. Access from the front driveway as well as the hallway the garage has been extended to offer extra space as well a separate cloakroom area. Window to front aspect, radiator, door to en suite. Coloured suite fitted to comprises of panel bath, WC with low level flush, pedestal wash hand basin, frosted window to rear aspect. Window to rear aspect, radiator, fitted mirrored wardrobe, radiator. Panel bath, WC with low level flush, pedestal wash hand basin, frosted window to rear aspect.